Our shelter is NOW selling Doggie DNA TEST KITS!! BUY ONE today for only $80 and includes shipping – if you can’t pick one up at the shelter just email STAFF@STERLINGSHELTER.ORG and make arrangements for payment and mailing info! Doggie DNA test kits also make a GREAT present for any dog lover/owner who would love to know what their MIXED breed is! With the holidays around the corner…get yours today! Where does Buddy get his curly tail from? Why does he love digging holes in the backyard? Could I be doing more to make him happier and healthier? Your dog may not be able to tell you the answers – but his DNA can. Wisdom Panel® Insights™, the most comprehensive mixed-breed cheek swab DNA test on the market, can help explain a mixed-breed dog’s ancestry. Over 25 million mixed-breed dog owners know their dogs…but not as well as they could. With the simple swipe of a cheek swab, Wisdom Panel® Insights™ can determine the ancestry of a mixed-breed dog by testing for more than 190 breeds, the largest database on the market. Within three weeks, dog owners will be e-mailed an official Ancestry Report that reveals the dog’s genetic background.A dog’s ancestry can influence him in surprising ways. Obvious and not-so-obvious physical traits plus behaviors like digging, herding and barking all come from the various breeds in a dog’s family tree. Once an owner understands a dog’s natural tendencies, it makes it possible to create a tailored training, exercise and nutrition program to fit his one-of-a-kind needs. 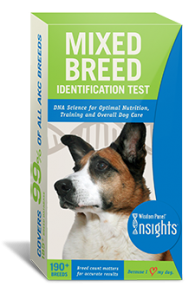 Order your Wisdom Panel Insights dog DNA kit today and discover your dog’s history! What will my dog’s report tell me? 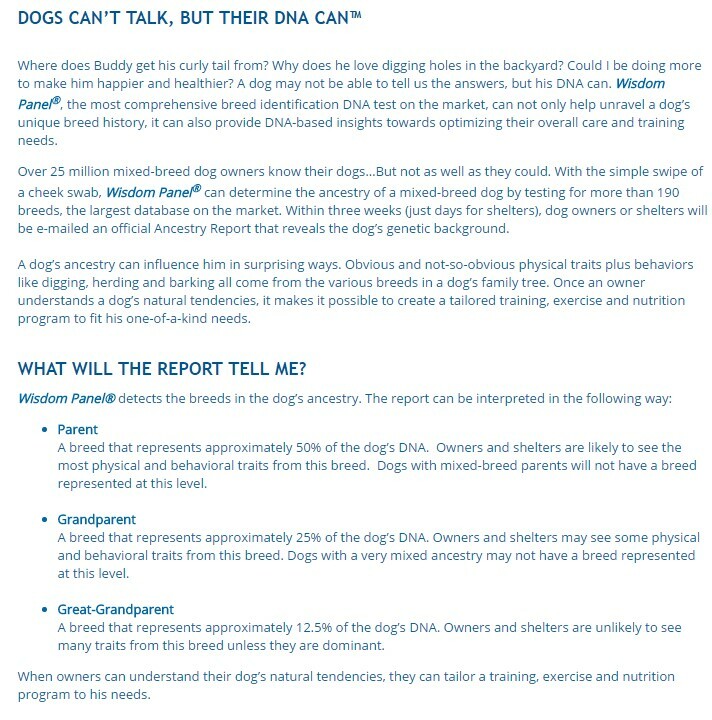 Parent A breed that represents approximately 50% of your dog’s DNA. You are likely to see the most physical and behavioral traits from this breed. Dogs with mixed-breed parents will not have a breed represented at this level. Grandparent A breed that represents approximately 25% of your dog’s DNA. You may see some physical and behavioral traits from this breed. Dogs with a very mixed ancestry may not have a breed represented at this level. Great-Grandparent A breed that represents approximately 12.5% of your dog’s DNA. You are unlikely to see many traits from this breed unless they are dominant. When you understand your dog’s natural tendencies, you can tailor a training, exercise and nutrition program to his needs.